From school days to the specials on offer in your local pub, the chalkboard has probably been a more constant element in your life than you would care to imagine or think deeply about. You don’t need to dwell on its use at school but if you are thinking about the special event of the day, there is a strong connection between the ever changing offers in your local restaurant or bar and what will hopefully be the most enjoyable and special occasion in your life. 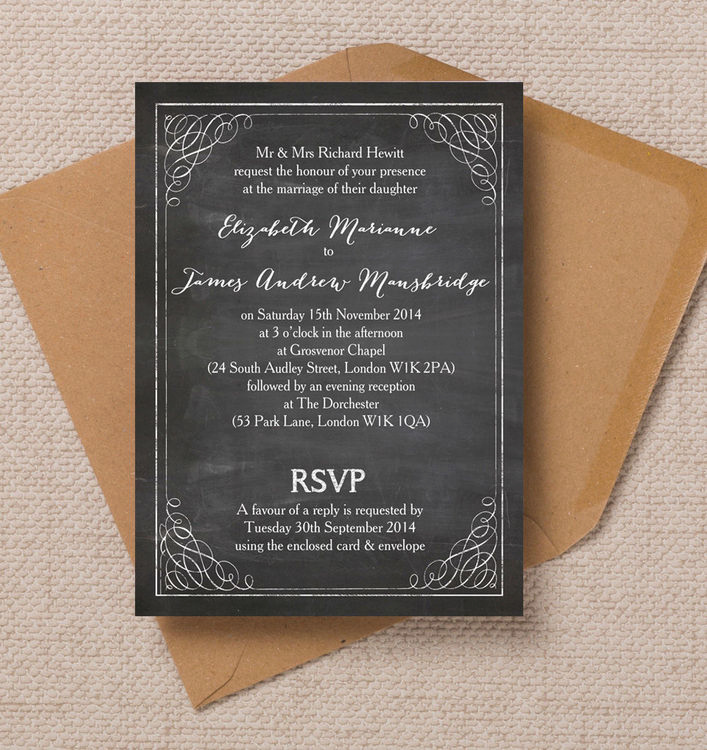 There are some wedding invitations that are abstract and appear to have a name that bears no link to what it looks like, but that isn’t the case with Chalkboard Wedding invitation. This is a card that comes with a stunning chalkboard background with all of the important information detailed in a stylish and retro-style font on the front. It is a subtle card, but it is a card that people will instantly connect with, which is what you want for your big day. This style of invitation also ties in with rustic images and a DIY ethic, so if you want to create a homely and laidback feeling, this ties in neatly. There is a range of additional stationery items in the same style, while the reverse of the card is more artistic and abstract, proving something more challenging for your guests to enjoy. There is a lot to be said for keeping things simple and stylish, which is what this invitation from Hip Hip Hooray, does in an easy manner. If you want to provide everyone with the important details in a fun manner, the Chalkboard Wedding invitation will get top marks every time. Tags: Chalk, Retro, Rustic, Simple.